Chicken BLTA Salad with Avocado Dressing - THE OLIVE BLOGGER - Recipes your family will love! I am so excited to feature this Chicken BLTA Salad from my friend Amber over at Simply Made Recipes! It is a delicious and fresh salad to help start your new year off right! This salad is LOADED with veggies and protein and is even topped off with a delicious avocado “bomb” sauce, which makes it perfect for lunch or dinner. Are you wondering what the BLTA stands for?? Well let me tell you! I mean, really guys, this salad is guaranteed to become a new favorite in your household!! Enjoy! Chicken BLTA Salad. 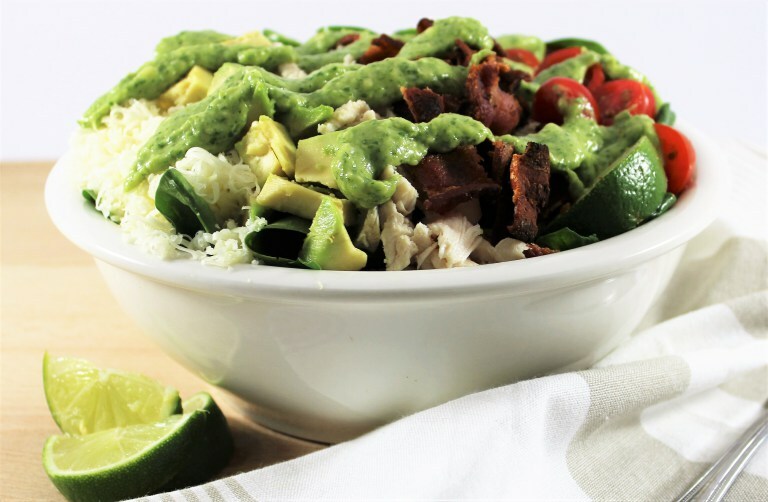 A delicious salad loaded with bacon, lettuce, tomatoes and avocados and topped off with an awesome avocado dressing! Guest post up now! Try these other recipes along with your Salad!! Easy Nutella Brownies – Fudgey and Chewy! A little heat is always nice with a salad!! OMG – I just died and went to heaven….you had me at bacon and avocados!!! For sure saving this to my Pinterest to indulge in later. Ha!!! I am the same, avocados are my go to in salads so this was a winner for me! wow this looks yummy! I bet the avocado dressing would go great on tacos!!! THAT is a great idea!!! Amber has a great avocado taco on her blog that she uses the sauce on as well…I can’t wait to try them! yumm this looks amazing! i’m always looking for good recipes to make for lunch! It is only breakfast and I am now officially starving! This looks amazing! Does it get any better for a salad? I’m pinning this and I can’t wait to try the BOMB sauce! Thanks for sharing! Yummy! This looks like a full belly salad! And who doesn’t love avocado dressing??? Wow, what a perfect salad. I could eat this every day.